Acrylic on wood panel, 42 x 36 in. Acrylic on wood panels, 54 x 135 in. Oil on linen, 42 x 36 in. Acrylic on linen, 42 x 36 in. Acrylic on linen, 54 x 45 in. Acrylic on linen, 54 x 135 in. Acrylic on wood panel, 24 x 20 in. Barbara Takenaga’s exhibition of recent work pushes her established formal vocabulary in surprising directions. The new abstract paintings capture the expansiveness and mystery of both the cosmic and the microscopic, while also recalling patterns in nature. A catalog with an essay by Nancy Princenthal is available. Working in acrylic on wood panel or linen, Takenaga arranges the simple components of her paintings, predominantly thin lines and small dots, into stunningly complex compositions that undulate, radiate, and recede in seemingly infinite space. In some paintings, crisp, saturated color defines each discrete element in the tightly woven, tessellated work. Other paintings introduce a subtler palette of grays and whites. The artist’s use of metallic pigments and intensive patterning activates the paintings’ surfaces, achieving shifts in depth and tonality as one moves around the work. Takenaga’s paintings are open to a range of interpretations and associations. Several elements of her work suggest ties to her experience growing up on the plains of Nebraska. Overlapping triangular forms in Ronin might relate to images of migrating flocks of cranes, while the endlessly radiating lines stretching toward the horizon in work such as Nebraska Painting evoke the geometry observed in rows of crops. 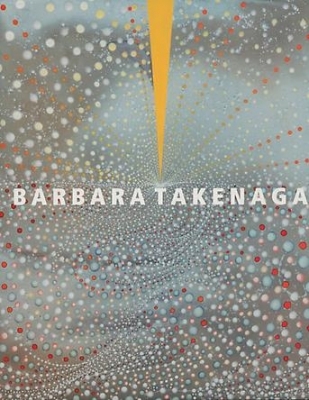 Barbara Takenaga divides her time between Williamstown, MA, and New York City. Her work has been exhibited at such institutions as Mass MOCA, North Adams, MA; Museum of Contemporary Art, Denver; and National Academy Museum, New York. In 2009 she received the Wauson Fellowship from the FOR-SITE Foundation, San Francisco, CA. Recently, her work was highlighted in the publication Psychedelic: Optical and Visionary Art Since the 1960s, released by the MIT press. Takenaga is the Mary A. and William Wirt Warren Professor of Art at Williams College, a position she has held since 1985.